With Joss Whedon at the helm once again, Nick Fury's superhero dream team reassemble in Avengers: Age of Ultron to thwart a sentient being's devious plans for annihilating life on Earth. In typical sequel fashion, the second entry in the franchise goes bigger and louder but lands with a somewhat disappointing thud, slightly losing focus on what makes these movies so appealing by making the villain more a bothersome distraction than a complementary foil that challenges the integrity of the team. The Avengers save humanity on 4K Ultra HD with a great-looking HDR10 presentation and a highly-satisfying Dolby Atmos soundtrack, making this the preferred way of enjoying the sequel. With the same set of supplements as the Blu-ray, the overall package is Recommended for fans and those wanting to expand their UHD library. 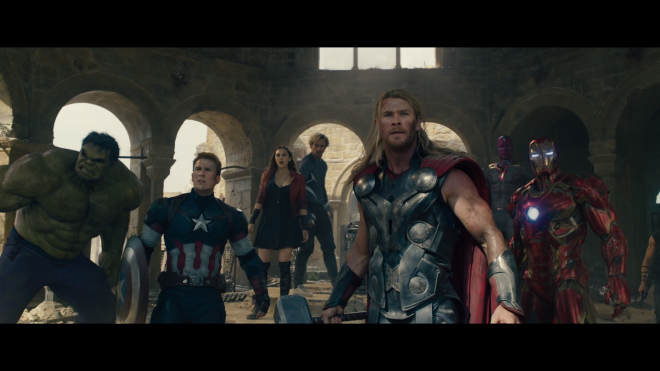 Picking up after the events of Captain America: The Winter Soldier, the Avengers assemble once again in Avengers: Age of Ultron to raid a Hydra facility in the small wintry country of Sokovia. It's a loud, explosive opening with so many separate, equally-loud-and-explosive side battles that it's difficult, at times, to keep track of what's going. 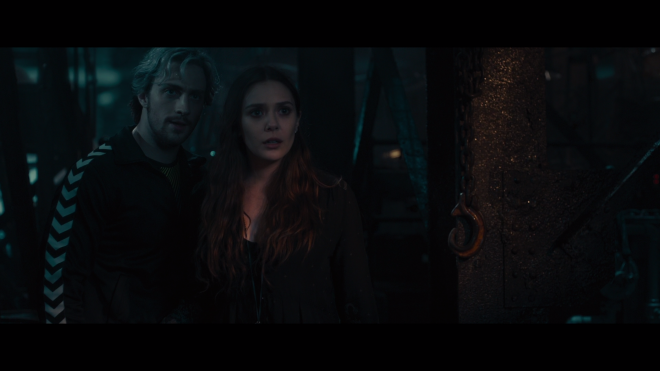 Eventually, we finally arrive at the point of this turbulent skirmish when the team learns the gem in Loki's scepter was used for conducting human experiments, and twins, Pietro and Wanda Maximoff, are the results of such testing. Despite my somewhat negative tone, the prologue scene is admittedly well-done, particularly for establishing some of the character issues later explored in more depth. Elizabeth Olsen's Wanda, a.k.a. Scarlet Witch, plays a significant role in this, using her telekinetic powers to induce deeply suppressed fears in each of the heroes. Specifically, Iron Man's PTSD gives rise to his fear of causing the deaths of his friends, which looking back after Infinity War now looks like a prophetic vision. The plot's central premise, however, arrives later when Tony and Bruce Banner discover the same gem hides an artificial intelligence, which the two men use for unwittingly creating the sentient being Ultron. And this is primarily where I find myself being slightly disappointed with the sequel. Unlike its predecessor — and ever more so after Infinity War — the second installment in the Avengers franchise feels distracted by Ultron's god complex and his various criminal activities around the world. Frankly, this takes away from what makes these movies appealing — the often-tense chemistry and conflicting camaraderie of the heroes while the villain challenges their small strides of cooperation and teamwork. 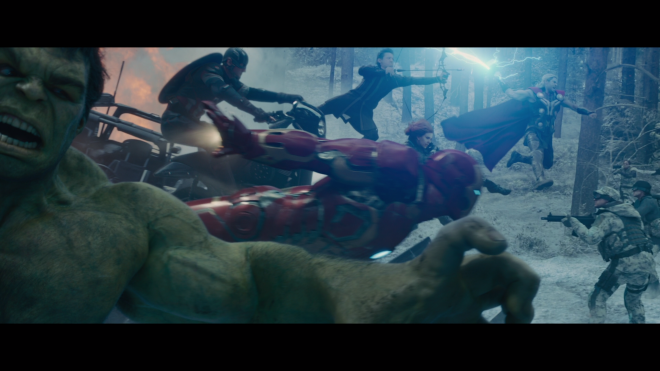 The closest we come to a heated disagreement is arguing over Tony's responsibility in Ultron's creation. Meanwhile, the plot begins feeling bloated as the roster of characters and other subplots expand, slowly culminating to the inevitable and very predictable climactic battle that honestly doesn't feel all that satisfying or memorable. 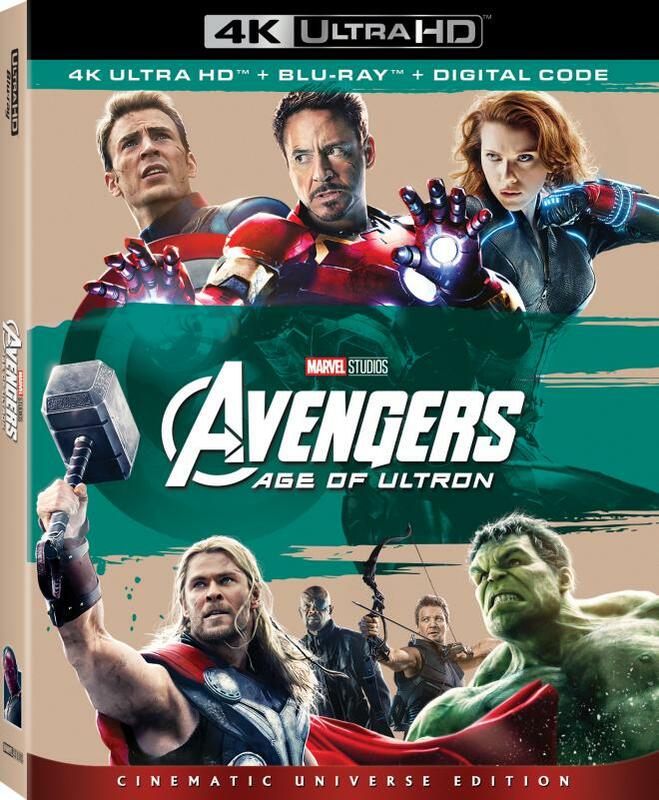 Walt Disney Studios Home Entertainment brings Avengers: Age of Ultron to Ultra HD Blu-ray as a two-disc combo pack with a flyer for a Disney Digital Copy. When redeeming said code via RedeemDigitalMovie.com, MoviesAnywhere or VUDU, it includes both the HD and 4K UHD digital versions while VUDU users will have access to a Dolby Vision HDR version with Dolby Atmos. The dual-layered UHD66 disc sits comfortably opposite a Region Free, BD50 disc. Both are housed inside a black, eco-vortex case with an embossed, glossy slipcover. At startup, viewers are given the option to start the movie and go to the main menu with full-motion clips and music playing in the background. 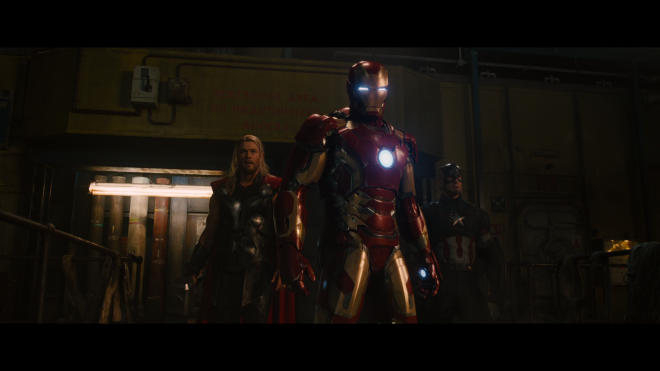 The Avengers are assembled once again to stop global annihilation, equipped with an excellent and occasionally stunning HEVC H.265 encode that offers several welcomed enhancements. Likely struck from the same 2K digital intermediate used for the Blu-ray, definition and resolution receive a nice boost, exposing sharper details in the costuming, some of the CG visual effects and in the architecture. However, the overall difference is pretty small and comparable to its HD counterpart. Shot on a vareity of digital cameras capable of at least 3.5K or higher, there are many moments softer than others, most of which are related to the camerawork and noticeable in extreme long shots. There are also several instances of mild aliasing along computer monitors, electric panels with lots of buttons and other sharp edges, evidence of an upscaled source. Sadly, mild as it is, it can be pretty distracting. On a slightly better note, brightness levels have also been upgraded, providing the 2.39:1 image with lots of the oily, full-bodied blacks and a lovely cinematic sheen. 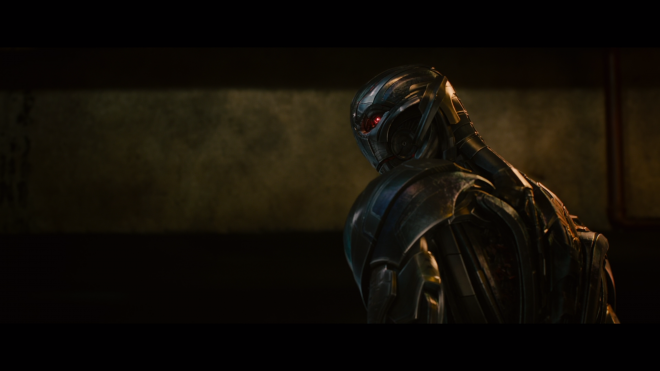 Because Ultra HD releases tend to be darker on the whole, shadow delineation isn't the strongest, often obscuring some of the finer details during poorly-lit sequences, such as when Ultron talks while engulfed in shadows. Still, the 2160p video maintains appreciable visibility in many dark corners of the frame. Contrast also enjoys a notable improvement, but the stylized cinematography of Ben Davis somewhat restrain and rein in the levels, focused more on a particular look depending on the environment, such as the scenes set in Africa. Nevertheless, whites are crisp and sharply brilliant, providing the action with a noticeable pop, and specular highlights are at times dazzling, providing metallic edges, the lining of clouds and explosions with sparkling realism. The superhero dream team charges to the recue with yet another high-resolution soundtrack that will have listeners grabbing the remote and increasing the volume by about 5dB. Or at least, that was the case in my system, which isn't too bad. Once adjusted, the Dolby Atmos soundtrack is highly satisfying, delivering several amusing enhancements that will make fans happy. Audiophiles, on the other hand, will probably note the somewhat limited and uniform mid-range, which is not to say it's inadequate or deficient. Only, that it is not very extensive or ever pushes far into the upper ranges. Nevertheless, the design remains clean and detailed, displaying some appreciable separation and clarity in the action and musical score. Vocals remain precise and crisp in the center during the loudest, action-packed segments. And somehow, the low-end offers a small but still notable improvement, feeling a bit more ample and commanding. Much of it is still limited to the mid-bass area, but there are a few moments with some awesome hard-hitting oomph, such as the Iron Man vs Hulk fight. In Avengers: Age of Ultron, Nick Fury's dream team of remarkable people are assembled once more to fight an über-logical, sentient machine named Ultron, who reasons Earth's salvation will come from humanity's extinction. Feeling as though biting off more than the filmmakers can chew, a rather bloated plot that also expands the roster of characters at the same time takes away a bit from what made its predecessor so appealing, but director Joss Whedon somehow manages to keep things entertaining and light nonetheless. The superheroes raid 4K Ultra HD with a great-looking HDR10 presentation that offers several notable improvements over its HD SDR counterpart and a highly-satisfying Dolby Atmos soundtrack, making this the preferred way of enjoying the sequel. Porting over the same set of supplements as the Blu-ray, the overall UHD package makes a great addition to the library.